Washaki Lodge is the quintessential, boutique Montana Home! This perfect blend of luxury finishes and rustic logs are awaiting you for your next Big Sky Escape! 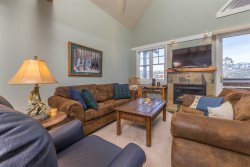 Located just minutes (.5 miles) from Big Sky Resort, nestled in a wooded area prime for wildlife viewing, the lodge is great for large families, multiple families, or groups of friends and colleagues. Take in the breath-taking views of Lone Peak from one of the lodges 3 large decks and living areas. After a fun day enjoying the outdoors, relax in a chair by the outdoor fire pit or take a soak in the private outdoor hot tub. - Outstanding location - Minutes from Big Sky Resort with amazing views of Lone Peak, 6.6 miles to Big Sky Town Center, 58 miles to West Yellowstone Entrance. - Gas Range,Coffee Maker, Coffee Grinder, Mixer, Toaster, Crock Pot, Blender, Roasting Pan, Bakeware, 18 Place Settings, Basic Spices, Starter Starbucks Coffee, Trash Bags, Dish Soap, Dishwasher Soap, Sponge, and Paper Towels. Fantastic, well appointed vacation home! Exceeded expectations. This vacation rental truly feels like someones home rather than a rental. It was well appointed with every kitchen tool you could possibly need. Large home with sleep accommodations for 18. We had two families of 5 on this New Years 2018 ski trip. The home has plenty of space to retreat for privacy and cozy places to gather together. The mud room with boot dryers and locker style cabinets coming in from the garage made it nice to take ski gear on/off. It was our first time not being in a ski in/out location, but the exchange of a short drive to the base area parking of Big Sky Mtn. Resort for increased square footage at our accommodations was well worth it. I would love to rent this home again - Im sad that it doesnt seem to be available in the summer.